Scarborough Covered Bridge, located in the Barclay Farm section of Cherry Hill, is one of two covered bridges remaining in New Jersey. A bridge sitting in the center of the Barclay Farm development in Cherry Hill Township is unlike any other bridge in New Jersey. Scarborough Covered Bridge is a small, two-lane, covered bridge connecting two sections of the Barclay Farm development. Constructed in 1959, the bridge is one of only two covered bridges remaining in New Jersey along with Green Sergeant’s Covered Bridge in Delaware Township, Hunterdon County. 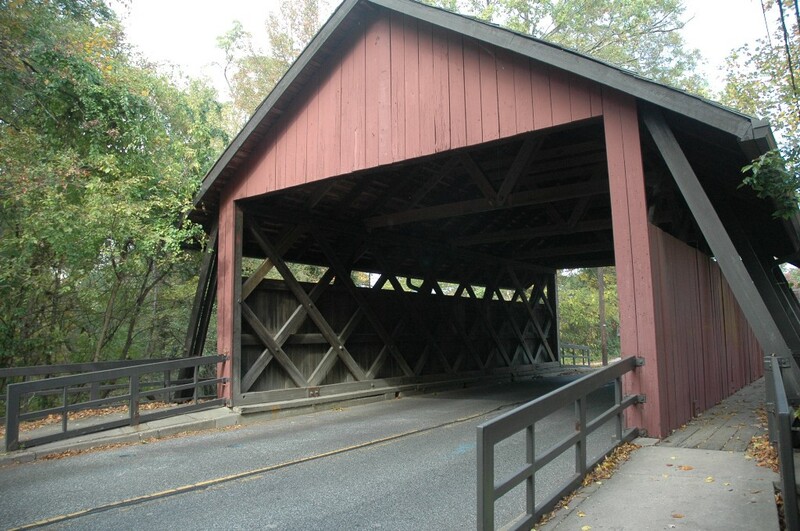 There was once as many as 75 covered bridges in the state. Mike Mathis and Lisa Mangiafico’s book, “Cherry Hill: A Brief History,” provides background on Scarborough Covered Bridge and why it was built. Bob Scarborough, the developer who built the Barclay Farm neighborhood, needed to construct a small bridge over the north branch of the Cooper River to connect separate sections of the development. Scarborough opted to construct a covered bridge to fit in with the New England-style of Barclay Farm‘s homes. At the time, the bridge was the first covered bridge constructed in the United States in nearly 100 years. Local architect Malcolm Wells designed the bridge. The bridge includes enough space for two-way traffic as well as pedestrian walkways on either side. A shingle roof covers both the roadway and walkways. The bridge cost about $32,000 to build. The bridge was officially dedicated on Valentine’s Day, 1959. To commemorate the occasion, 101 couples kissed on the bridge in a special ceremony, leading the bridge to be known as the “Kissing Bridge.” The ceremony also included a variety of 20th century vehicles, including everything from horse-drawn carriages to the entire line of 1959 Ford cars. After the dedication ceremony, the bridge was turned over to the township. The bridge was renovated and rededicated in 1993. 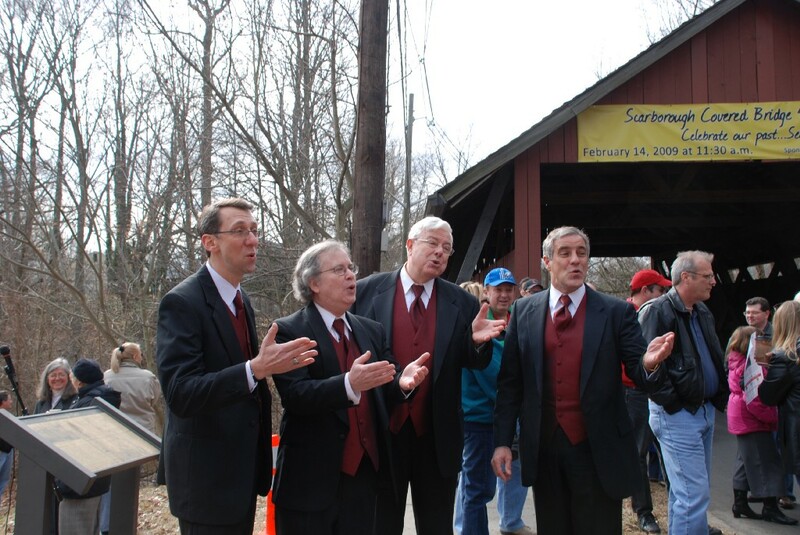 In 2009, the original dedication ceremony was recreated to mark the bridge’s 50th anniversary. 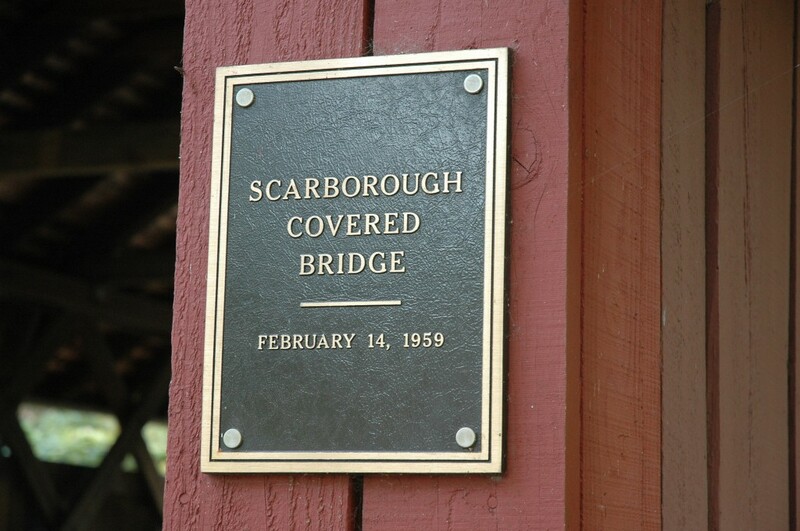 The National Society for the Preservation of Covered Bridges recognizes the Scarborough Covered Bridge and its historical value. Hundreds of vehicles continue to travel over Scarborough Covered Bridge daily. In addition, pedestrians can still walk across the bridge using the pathways on either side. On the north side of the bridge is a small open field with a few benches sitting under trees. A sign lists the field as Scarborough Park and details the history of the neighboring covered bridge. In addition, the north side of the bridge includes a sign with the bridge’s name and the day it was originally dedicated. Would you like The Sun to write a feature on a specific part of Cherry Hill history? Do you have old photos of Cherry Hill’s past that you would like to share with us? Email news@cherryhillsun.com and tell us your suggestions for a future Throwback Thursday feature.